There was no official attendance number for the Thursday night showdown between Las Vegas and Valley, but marking a box labeled “Full Gym” might be sufficient. 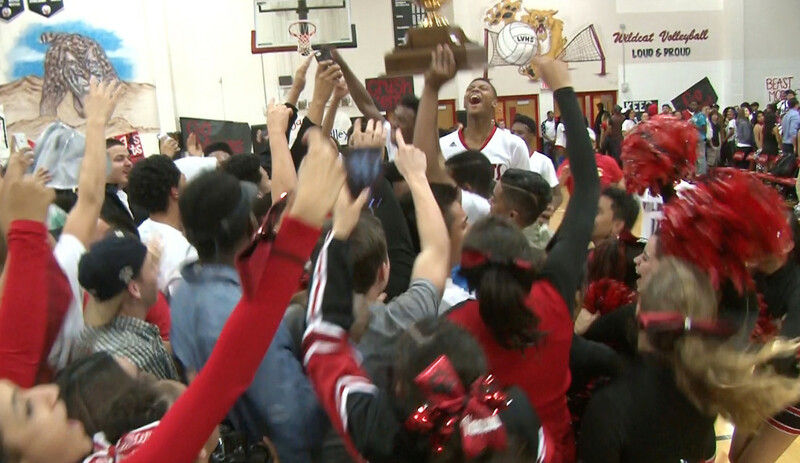 With both sets of fans trading cheers, both teams traded runs all game long, as Las Vegas topped Valley 69-64 to claim a three-peat of the annual V-Game title. “Fans, they loud,” Las Vegas junior Tyler Bey said with a smile after the game. Bey led the Wildcats with 19 points, including a back-to-back putback dunks in the second quarter, which put Vegas ahead by double digits, providing enough of a cushion for the team to withstand several Valley runs. Valley’s 77-62 victory over Las Vegas two weeks ago was clearly a fresh memory for the Wildcats. “It’s perfect motivation,” Bey said. More importantly for Vegas, the win ties the season-series with Valley, and improves the team’s record to 2-1 against Valley and Canyon Springs, the other two Northeast League powerhouses. The Wildcats end the regular season hosting the Pioneers next Wednesday. Las Vegas senior Devon Colley finished with 15 points, while sophomore Marquise Raybon added 13 and senior Patrick Savoy had 11 to round out a balanced scoring effort for the Wildcats. Valley senior Cam Burton led the way with 24 points, including a baseline drive late in the fourth quarter that led to a three-point play that pulled the Vikings to within 60-57, the closest the team would get after the Vegas second-quarter run. Senior Darrion Daniels added 19. Las Vegas will host Findlay Prep on Monday, while Valley travels to Canyon Springs. Great update Steve. Thank you. Nice looking/informative site! I'm sure it will be a hit! © 2019 My LV Sports. All Rights Reserved.